The Utah Amateur Radio Club gives examinations for all classes of amateur radio license on the first Saturday of even-numbered months. Preregister: If you plan to test for a license, be sure to contact Gordon Smith, K7HFV, at least one day before the exam date. Time: Arrive between 8:00 and 8:45 A.M.
License Document Once you qualify for a new license or an upgrade, you will likely not get a license in the mail. Since February, 2015, the FCC no longer issues license documents on paper by default. Official proof of being licensed is now the presence of an entry in the FCC's ULS database on line. If you would like a paper license document, there are several ways to go about getting one. See www.arrl.org/obtain-license-copy for details. To approach from Interstate 15, take the 2100 South exit, then go east to State Street. 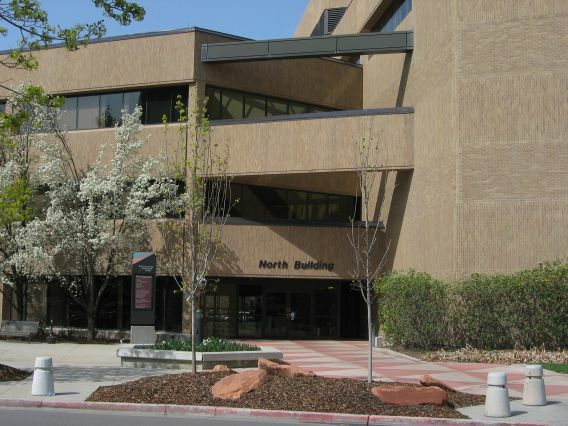 The buildings are on the northeast corner of the intersection of 2100 South and State Street. The parking lot is just east of the building. If you approach from the west or the south, the best strategy is to go north on State Street to Westminster Avenue (1905 South), turn right on Westminster, and then almost immediately right again, into the parking area. Observe the signs to find a space that is open to the public. There are two very similar buildings connected by a skywalk. You must enter through a door on the east side of the north building near its south end. (See photo below.) Do not try to enter the “Employees Only” entrance near the north end of the north building. Explain to the guard why you are there and sign in on the register. There are elevators along the west wall. Use them or the nearby stairway to get to the third floor. Upon exiting the elevator (or stairway) turn left and go north along the hallway. Look for a room on the right with lights on and an “Amateur Examinations” sign on the door. We will usually have a check-in table set up in the hallway just outside the room. If you should, instead, get into the eastern hallway, look on your left for a door marked N3-930 and “Conference,” and you have arrived.